APL-300 is a fully automatic packing line from single piece PVC insulation tape packing to tube type multi-piece tape packing. 1. Machine adopts touch panel operation which is fast and easy. 2. With international advanced technique and production, machine performance is stable. 3. Machine is by PLC control. 4. Specially designed sealing cutter for solid packing. 5. 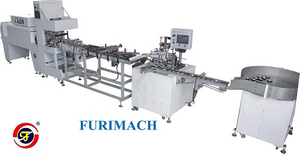 Both separate paper label and printed film roll label can be used. 6. Only one set of mould is needed for different tapes. 7. Shrink tunnel uses imported double fan motors to make tunnel hot wind average and packing products beautiful.